Heat oven to 425°F. On ungreased cookie sheet, place bread slices. Brush oil on slices of bread. Bake 4 to 5 minutes or until very light golden brown. Cool 5 minutes. Meanwhile, stir together all remaining ingredients except garlic. Cut garlic cloves in half. Rub cut sides of garlic over toasted bread slices. Spoon mixture onto bread slices. Serve immediately. 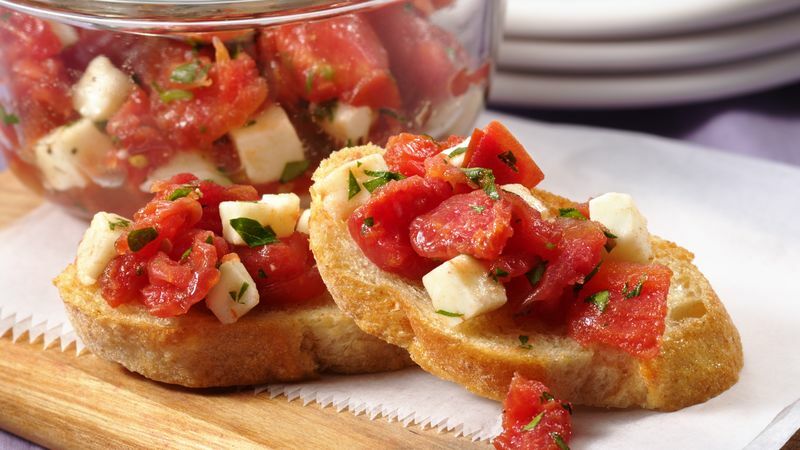 Crostini are simply small, thin slices of toasted bread that are brushed with olive oil. Rubbing the crostini with garlic cloves imparts extra flavor. Arrange these tempting, impressive appetizers on a pretty platter, and garnish with sprigs of fresh basil.